I have another Warm & Fuzzy Friends card to share with you today. That amazing Warm & Fuzzy Friends Card Kit is available now! Don't miss out on your chance to get this fabulous kit for an amazing price! I paired the adorable moose with some of my favorite scenery dies to create this fun card. The hills were created with the Stitched Snow Drifts and Stitched Mountain Range Die-namics. The clouds were die-cut with the Puffy Clouds Die-namics. The fun sentiment is from the the Warm & Fuzzy stamp set, it was stamped on a flag from the Blueprints 27 Die-namics. Be sure to check out the MFT Blog to see all the amazing cards our fabulous design team has to share with you. Beautiful card! The snowy mountains are exquisite!!! Love this new card kit! Love the scenery you created for this moose. How cute and colorful. I like that moose! What a cute scene! I love the unique sentiment and snowy mountain tops! Peaceful nature captured so well in your card! A very cute scene and a great mixture of Die-namics, the fresh air would be very, very fresh! Lovely, thank you. Great scene! This kit is so cute! I am a bit obsessed with the moose...but a moose in the mountains? Eek! So perfect! What a darling card! 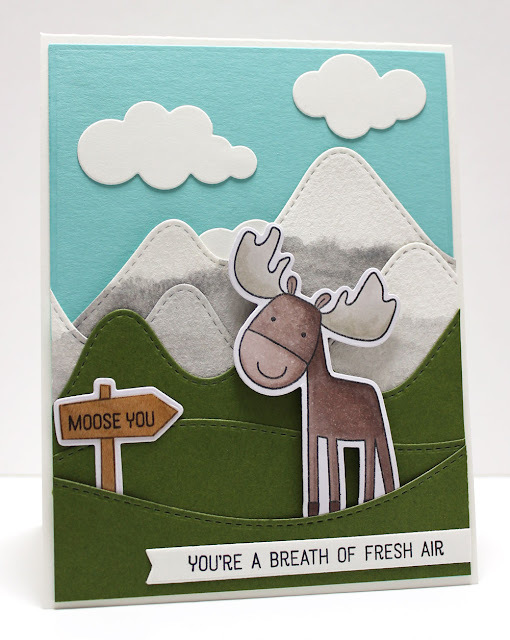 Your hills and mountains look fabulous with your happy little moose! Fab depth and cool wintery snow-capped mountains! Sweet card. Love the gray snowcapped mountains. I love the snow-capped mountains! And you moose is adorable. so cute!! love the snowy mountains! Such fun sentiments in this great set. I really love this little moose. Love your scene and how you colored the mountains! Wow! I love the warm & fuzzy friends card kit!!!! Your card is so sweet!!!! What a cute card - great coloring and layers!